A couple weeks ago I wrote about The Secret Sisters’ 7” single “Big River” that Third Man put out and how I’ve been really excited to hear what their debut album was going to sound like. Well, they’ve released the first single, “Tennessee Me,” and it is truly incredible. Lydia and Laura Rogers have the kind of close harmony blend that other sibling duos like The Louvin Brothers, The Everly Brothers and The Andrews Sisters are revered for. The gentle shuffle of “Tennessee Me” provides the perfect landscape for their pristine vocals to really shine in. The piano, acoustic guitar, pedal steel, brushed drums and quiet bass evoke a perfect, sepia-toned vibe for this ready-for-transistor-radio love song. T Bone Burnett is producing the album and his musical knowledge and Midas touch for vintage sounds promises to be a winning combination for the girls. After hearing this first track, my anticipation level has heightened even more. The Secret Sisters debut album will be released on October 12th on T Bone Burnett’s new Beladroit label. 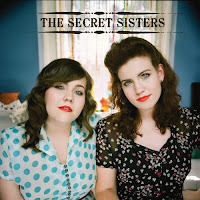 You can find out more about The Secret Sisters and pre-order their new album HERE.